Crafter’s Companion founder Sara Davies was on hand to inspire the next generation of art and design students from Darlington College. 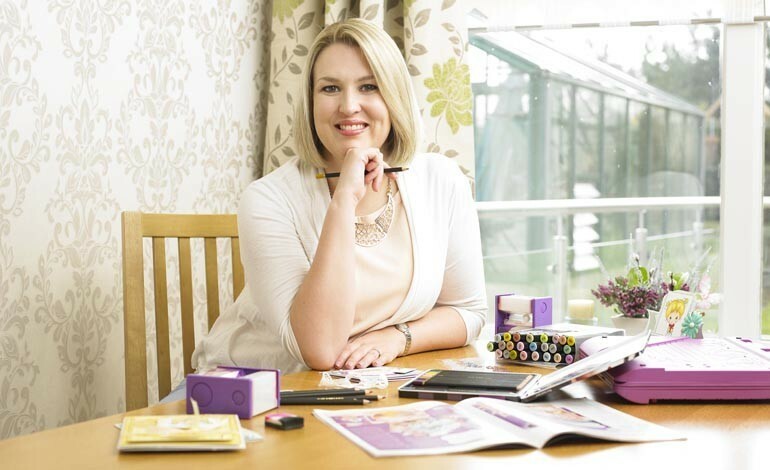 The award-winning businesswoman from County Durham delivered a card making and colouring workshop to a group of students as part of a wider plan to get more people involved in crafting and inspire budding entrepreneurs. The workshop included a presentation from Sara about how she went from a start-up business while at university to a global company with customers all over the world and an operation in California. The talk coincided with the planned opening of the company’s first ever UK retail store at Aycliffe Business Park in May. The store is being designed to be the brand’s flagship store that is intended to educate and become a destination for anyone interested in crafting. Star Radio were present to film the event, and the breakfast show presenter, Tim Lichfield also took part in the workshop at Darlington College, which will be followed by a unique stamp design competition that will run on the radio station. The competition, which is open for entries until the end of May, will give winners in different age categories the chance to have their bespoke rubber stamp design produced by Crafter’s Companion. The winners will be announced in June. Alan Jones, curriculum manager at Darlington College for art, media and journalism, said: “It was great to have Sara come in and inspire our art and design students and to show what you can achieve with hard work and dedication. Crafter’s Companion specialises in manufacturing, distributing and retailing crafting tools and products, which are currently sold online via its website, on TV shopping channels across the world and by thousands of independent retailers.